My sense of awe for Mother Nature, my experiences living in earthquake country, and my aspiration to write thrilling stories all combine in the pages of my first novel. Have you read a novel that features a natural disaster in the story? You might want to give The Doctor’s Dilemma a try. Set in a remote village in Mexico, the last thing the characters want to do is get involved in a romantic relationship. They spend their time working hard in the pediatric clinic and trying to avoid each other. When disaster strikes they soon realize they are equally committed to helping the community, and their close working relationship makes it impossible to ignore their attraction to one another. 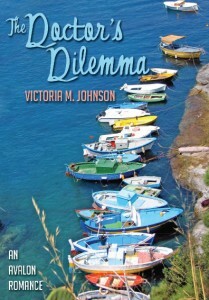 The Doctor’s Dilemma is a finalist in the 2012 Booksellers’ Best Award. (A Published Author’s Contest for books published in 2011 sponsored by the Greater Detroit RWA) It finaled in two categories, Best Traditional Romance and Best First Book! Winners will be determined in July 2012. Cross your fingers. Amazon currently has The Doctor’s Dilemma SALE priced! Get your copy before they’re all gone. An iceberg is an enormous piece of ice made of freshwater that has broken off from a glacier or ice shelf and is floating in open water. Icebergs are at least seventeen feet above the surface of the water and fifty feet long. Anything smaller is called a growler or bergy bits. Icebergs are classified by shape, most commonly being either tabular or non-tabular. Tabular icebergs are block-like and have steep sides and a flat top. These are found at the ice shelves of Antarctica. Non-tabular icebergs have domes and spires, called castle icebergs and are formed from the Greenland ice sheets in the arctic regions. One of the biggest castle icebergs ever reported by the Coast Guard was 550 feet above the sea. That’s taller than the Statue of Liberty! The largest tabular iceberg on record was over 31,000 square kilometers (12,000 sq mi) sighted in the South Pacific Ocean, by the USS Glacier in 1956. This iceberg was larger than the country of Belgium! More than two-thirds of the Earth’s freshwater exists as ice in the form of glaciers and ice caps. Due to their constant shifting, icebergs can be a threat. Using satellites and other instruments, icebergs are monitored worldwide by the U.S. National Ice Center (NIC) and the International Ice Patrol (IIP) an office within the Dept of Homeland Security. Perhaps the most famous iceberg is the one that collided with the Titanic. Here’s an interesting story about the birth and fate of that castle iceberg: What Happened to the Iceberg That Sank the Titanic? Check out this awesome iceberg activity. Click below to start the video.